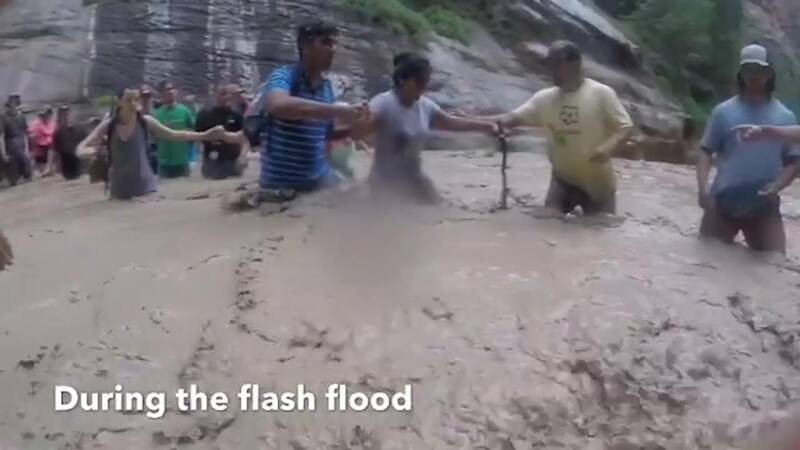 ST. GEORGE — Hikers visiting Zion National Park Saturday morning formed a human chain to help each other cross a dangerous swollen river when a flash flood hit a canyon where they were hiking. Video of the rescue was posted on Instagram Wednesday by Jhonatan Gonzalez of Maui, Hawaii. Gonzalez was hiking the Narrows with a group of family members on a hot and sunny day. The group was a couple miles into the hike when the initially calm river rapidly started to rise, becoming waist-deep in an instant, according to the post. Gonzalez described the ordeal as “heartwarming” to watch as strangers joined the chain to help those who were struggling to get through the rushing waters choked with logs and debris. Zion park officials closed the Narrows and other trails Saturday afternoon when a flash flood warning was issued by the National Weather Service. The Narrows closes to visitors anytime such warnings are issued or when the water flow rises above 150 cubic feet per second, and the popular hike remains closed for two hours after the warning is lifted, according to the National Park Service. Heavy rainfall can lead to rapid onset of flooding, with some of the most prone areas being slot canyons, burn scars, normally dry washes and low water crossings, even when the actual storm is many miles away, according to the National Weather Service. The Narrows are susceptible to flash flooding because much of the surrounding area is bare rock that does not absorb water. Storm runoff is funneled rapidly into the Narrows. 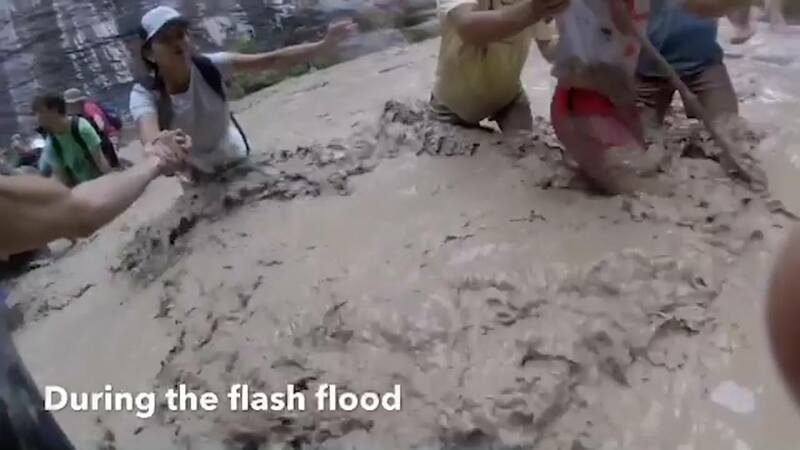 In September 2015, the bodies of seven hikers were recovered in Zion National Park after the group suddenly became caught in flash flooding in Keyhole Canyon. Visitors to the park are advised to always check the weather forecast and the flash flood potential before starting their trip. “Despite the forecast, flooding is possible at any time, and floods have occurred on days they were not expected,” park officials said. As this report is published, a Flash Flood Watch is in effect Friday from 2 p.m. to midnight and covers Utah’s Dixie and Zion National Park, southern mountains, Glen Canyon Recreation Area/Lake Powell, south central Utah and the San Rafael Swell. Affected cities include St George, Kanab, Escalante, Bullfrog, Loa, Panguitch, Green River, Hanksville and Bryce Canyon. Glad they made it out safely! They are truly lucky we are not reading about 20 drowned or missing people! Lucky is right. Another inch or so of rain they wouldn’t be wading across like that; they’d be swept away. How would the ‘photographer’ feel if it came to be that someone drowned only because he/she was on the phone, instead of helping out? Happens all the time now, flash floods, plane evacuations, etc. Did STG News pay for that, just wondering.